Alphabet cards are a great way for children to learn the letters of the alphabet and how to read. They can be collected and serve as beautiful decoration in a child's bedroom, in a nursery room or in a classroom. Alphabet letter cards usually have the letters in lower and upper case. Often times younger children learn the letters of the alphabet in upper case but then are unable to recognize letters in lower case. That's why these letter cards which have letters in both lower and upper case are quite helpful. These cards have an image or a cartoon representing the letter (for example, the letter "B" would have the image of a bee). Children love images and having images also helps them memorize each letter. 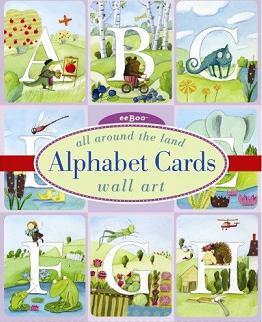 Alphabet letter cards can also be used to decorate the wall. Actually they can be great decoration in a classroom or in a child's bedroom and a great way for children to memorize the letters of the alphabet as they look at the cards on their wall. Alphabet letter cards can also be used for memory games. Pull a letter card randomly and ask your child to name the letter. When playing a memory game, you can also ask your kid to make the sound of the letter. You can also use the cards to write words or play a game that consists in writing new words with the cards that each player has. Which cards should you choose? You can actually create your own cards. Smart-kid-educational-games.com provides printable letter cards that you can freely use. You can ask your child to be creative and draw an animal or an object next to letter. We recommend the Eeboo All Around the Land Wall Cards. These letter cards are beautiful and contain illustrations with a nostalgic style that children love. They can also serve as beautiful decoration in a child's bedroom or playroom. These cards are a great way for children to learn the letters of the alphabet. Unlike other cards which can be quickly destroyed by children, the Eeboo cards are very durable being made of thick quality stock paper. By the way, the cards are 8" by 10". Among all the alphabet cards that you can get in the market, we definitely recommend these ones.